The 2019 BMW X7 xDrive50i is not for driving enthusiasts, but it is actually pretty great to drive. This 5,400-pound SUV is as sybaritic as it is futuristic with toys like LED mood lighting in the sunroof, heated third-row seats, an intuitive head-up display and almost comically effortless acceleration. Don’t bother trying to compare this to an M3, from the current era or any prior. BMW has been about more than just lean performance machines since forever. (The whole era of the New Class and the 3 Series only goes back to the ‘60s and ‘70s). The X7 is a logical evolution of the other thing this brand has been doing: luxury cars on the cutting edge of technology. But even though the X7 is absolutely antithetical to what a purist would call an “ultimate driving machine,” I’m almost embarrassed by how much I enjoyed this vehicle. It’s that well done. I will say that the X7’s grille looks just as ostentatiously oversized in person as it does in pictures (I forgot to bring a tape measure to check how large it is really) and the interior goes from cool to overcompensating very quickly if you pick the wrong options. But the SUV’s proportions in general are pretty inoffensive. And in a world where the Rolls-Royce Cullinan and new Chevy Silverado are roaming free, I have a feeling X7s are going to start blending into traffic more seamlessly than you might think, or than your local Z3 Clownshoe driver might want to believe. For those of you who came in late: the BMW X7 is a large all-wheel-drive sport utility vehicle that can easily carry six or seven people, or the entire contents of an Amazon-sponsored college kid’s dorm room. The xDrive50i makes 100 mph feel like a comfortable canter, and road noise is so completely obliterated that you can hear the tapping thumbs of a passenger texting two rows behind you. That is, unless you turn the stereo on or put a car with the M Sport package into sport mode. Then you can let the exhaust send out a few snorts. As I bet you’ve already worked out, the X7 is the SUVcation of the 7 Series luxury sedan, and a direct rival to the Mercedes-Benz GLS. The V8-powered xDrive50i stands empty at almost 203 inches long, about 71 inches high and just shy of 79 inches wide. So no “big truck” lights needed, barely. I already approximated the DIN curb weight, which is actually 5,423 pounds. This SUV is rated to carry 1,753 pounds of people and possessions. 220 pounds of that could safely go on the roof. The slightly lighter six-cylinder version can carry a bit more. A BMW rep told me it can tow more than 7,000 pounds. BMW’s spec sheet says cargo capacity ranges from about 11.5 cubic feet to almost 75 depending on how many seats you can flip down. For your reference and scale, the neighbor you looked down on with a Honda Pilot beats you with a claimed 18.5 to 109.2 cubic feet of space. The family down the way with a Chevy Suburban absolutely lounges by comparison with a claimed 39.3 behind the third row, and a max capacity of 121.7. 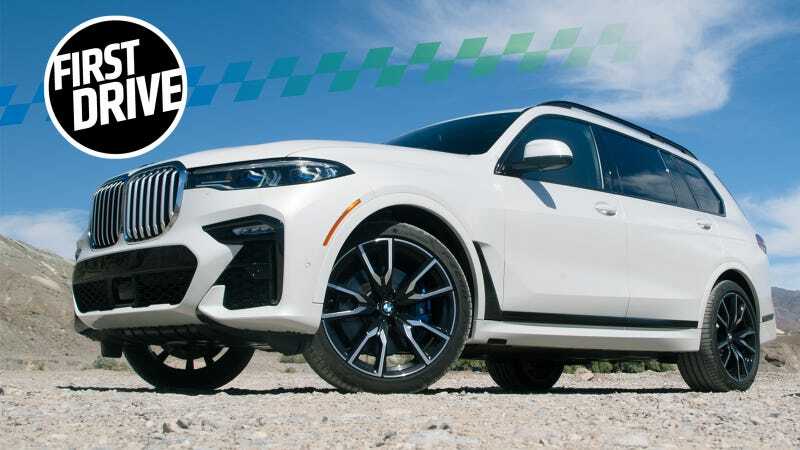 The stronger of the two BMW engine options, somewhat misleadingly denoted by the “50i” name, is a twin-turbo 4.4-liter with BMW’s VANOS variable cam timing making a factory-claimed 462 horsepower and 479 lbs-ft of torque. Everybody gets an eight speed automatic with full-time all-wheel-drive, and the paddle shifters are quite responsive. That top of the range vehicle will set you back right around $93,000 before you start adding options. You could also have an xDrive40i with BMW’s ubiquitous 340 hp turbo inline six for about $74,00, but I haven’t driven that so we’ll have to talk about it another time. BMW smartly doesn’t use the word “autonomous driving” to describe any of its functions, but on a well-marked road with the car’s assistance tech activated, the X7 does effectively cruise and steer itself, with caveats. Tap a button on the steering wheel and lines will appear in the gauge cluster and HUD, along with a steering wheel icon in the middle. Set your speed with the cruise control, also activated by your left thumb, and when those icons go green the X7 can maintain speed, follow a lane, even through turns, without driver input. With the system running, the X7 will bring itself all the way down to a stop, and then proceed again, in stop-and-go traffic without any driver inputs. It can even change lanes for you if you hold down the turn signal. It does not, however, like to operate without a hand on the wheel and the car will remind you that you do in fact still have to be paying attention with a yellow icon and a beep, and then a louder beep, and if you really can’t be bothered to retake control the X7 will throw up a red icon and bring itself to a full stop. The assistance features did pretty much seem to work as advertised. Stopping and starting in traffic is a lot more abrupt that it would be with an attentive human in full control, but it does allow you to relax a bit. At least, if you’re the kind of person who’s comfortable delegating vehicle control to a set of sensors and computers. I learned that I am not; the stress of wondering if the system would fail at a particularly inopportune moment outweighed the relief of not having to push the X7’s pedals for me. I don’t want to bother talking about the grille again, but, yeah. Posted up on some patch of desert between LA and Las Vegas, the 2019 X7 looked more like a modern art installation than a car. Open the door, climb in, sit down and sink just enough to feel like you’ve been enveloped without being stifled. I make no exaggeration when I call these seats the most comfortable sitting experience I can remember having a car. On the road torque is abundant, ride quality is halcyon and you can pretty much never tell how fast the X7 is going for better or worse. Fortunately, the head-up display is remarkably intuitive. I have not been a big fan of HUDs in the past, and I still don’t love them for performance driving, but the simple layout of this one with its map that automatically and smoothly zooms in and out is a nice simplification of the many pieces of information that the X7 can feed you. When you do want to see more, the current iteration of BMW’s iDrive software is actually quite easy to use and self-apparent. There are plenty of hard buttons to cut straight to important menus, and those are easy to navigate once you open them. The X7’s best “feature” is principally its abundance of features. Or, well, some of the toys are gimmicky, but they’re fun. Color selectable mood lighting is all over the interior, including as a frame around the gigantic sunroof. The infotainment system can read you the news. Optional rear seat entertainment screens can display the map with the car’s position, which can make your kids feel like navigators in a spaceship. Which I, personally, would have loved 20 years ago. Some of its other tricks are plain useful. Like the switch at the driver’s left hand that can slide the second row of seats forward or back, or the heated third row that I don’t think I’ve heard of any other cars having, or all that driver assistance technology I described. The X7’s multitude of cameras makes low-speed maneuvering remarkably easy. Your fancy computerized key lets you do things like lower the car and set its temperature remotely, or you could use a BMW app and look around your BMW via its parking cameras from your phone in real time. For all the X7’s interior fancifulness, including its opulent light-color leather options and illuminated accents, I have to say it felt disappointingly similar to the Mercedes S-Class coupe I drove around Detroit for a couple days over a year ago. I mean, even down to the silver design of the speaker grills and wraparound nature of the digital gauge cluster and infotainment screen, the aesthetic similarities between the X7’s cabin and its rival’s felt pretty strong to me. Then again, “a lack of originality” isn’t much of a complaint against a car designed for mass appeal. And the interior of the X7 does look good on its own. At least, as long as you don’t spec the bejeweled shift knob. There was some debate over whether the optional clear faux diamond-looking shift knob and matching volume knob and iDrive control were made of Swarovski crystal or not, but regardless, it’s ghastly. Looks like something that would be on the end of a Halloween costume cane. Or on my grandmother’s mantle. That said, I’m pretty sure my grandmother has aged into BMWs target demographics, so maybe it knows what it’s doing. I hated using BMW’s gesture control, too. But I have a feeling it’s more of a harbinger of something later that could be cool, rather than a piece of tech that’s going to change our lives. The 2019 BMW X7 is extremely luxurious, deceptively fast and aggressive in its leveraging of modern automotive technology. As opulent transportation, it is objectively excellent. Long drives from a seacoast city to a ski resort in one of these would effectively start your vacation early. Buzzing around town in one would be exceedingly pleasant, albeit wasteful. It might be hard to decide whether or not you’re comfortable staring it in the face, but it’s hard not be comfortable sitting in any of the X7’s seats.